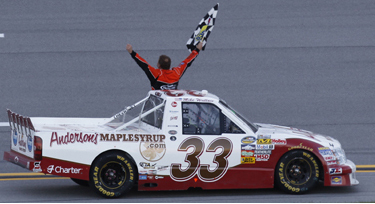 Anderson's Maple Syrup, Inc. and Nascar Camping World Truck Series team Kevin Harvick, Inc., teamed up one final time in 2011 in the Camping World Truck Series on October 22nd at the Talladega Superspeedway in Talladega, AL. 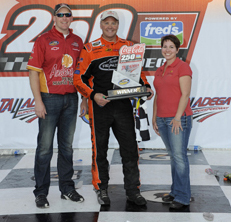 NASCAR veteran Mike Wallace, brother of Rusty and Kenny Wallace, drove the #33 Chevrolet Silverado to victory lane, with teammate Ron Hornaday finishing second. 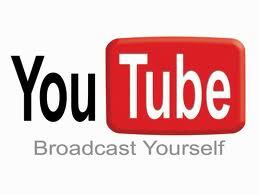 The race was broadcast live on SpeedTV. 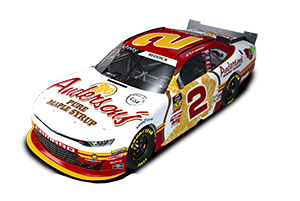 Initially, Ron Hornaday was slated to drive the Anderson's Maple Syrup #33 truck, with KHI teammate Elliott Sadler piloting the Bad Boy Buggy #2 Silverado. Because of Hornaday's run for a 5th Camping World Truck Series championship, and a scheduling conflict with Sadler (baby due), it was decided that Ron would drive the #2 Bad Boy Buggy Chevrolet, and Mike would drive the #33 Anderson's Maple Syrup Chevy. Teaming up to draft with each other around the 2.66 mile super speedway, Hornaday and Wallace were the fastest trucks in practice on Friday, and that speed carried over to the race on Saturday. After qualifying 5th and 6th respectively, the two drivers immediately moved to the front of the field, with Wallace leading 54 of the 94 laps in the race. The win was not only the 3rd in a row for KHI in the truck series, but was the first ever for Chevrolet in the series. View the video of the last 2 laps from Mike Wallace's incredible win at Talladega. Click here for a press release for this race. Click here for a recap of this race.